Which app: dwMap, routeCourse or mapField? Each of our three Garmin Connect IQ apps serves a different need, and runs on a different set of Garmin devices. Here we're going to first explain what each app does, then afterwards run through some popular use-cases to help guide you to the best one for you. Anything said here refers to the free version of each app, unless we explicitly mention our Premium option. dwMap adds a route download and map display feature to your watch. Routes are created and imported using our website, then dwMap shows the route and where you are on it. dwMap also offers data fields and a recording capability so that you can use it instead of the built-in Run/Bike/Hike feature. 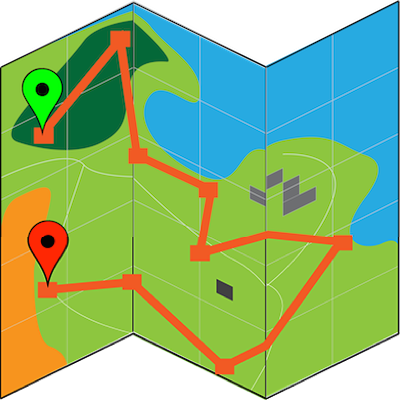 routeCourse is a route (course) downloader. You again use our website to import and create routes, then routeCourse makes downloading them easy and wireless. The downloaded courses are used with the built-in Run/Bike/Hike feature on the Edge GPSes and higher end watches that support courses. mapField is a "custom data field", which means you can add it as a data field to the built-in Run/Bike/Hike feature of your watch or Edge. Again you use the website to manage your routes, then mapField lets you view your route on one of the your data fields pages. Why is each one of these useful? Many popular Garmin watches, such as the Vivoactive 3 and Forerunner 235 do not have any built-in ability to displays routes. dwMap adds that, and makes it easy to import/create and download your routes. For Edge units and watches such as the Fenix 5 that can display courses, downloading routes (courses) to them used to be difficult and time consuming, and best done over a USB cable. routeCourse makes the whole process fast and easy, including bringing in routes from popular route sharing websites such as Ride with GPS and Strava. Some users prefer to use the built-in Bike/Run/Hike apps on the Edges and watches, perhaps because they use special hardware like the Stryd running power sensor, or they like to use other Connect IQ custom data fields such as Strava Relative Effort or Garmin Graphical Elevation. mapField lets you view your route alongside these other data fields. It is more basic than dwMap, as "data fields" are not allowed to do as much as full "app". A key point to know is that when dwMap runs, it can be the only app running on your watch. Usually this is perfect, as it has its own data fields, and the activity is recorded using the standard recorder on the watch (and syncs to History and Garmin Connect as normal). mapField was added to cover the case where this is not ok: dwMap is by far our most frequently used app, but when you do want to use the built-in Hike/Run/Bike for some reason, mapField offers some of its features as a data field. I am a runner with a Forerunner 230/235, Fenix 3 or Vivoactive 3 or HR and want to see my routes as I run. This is dwMap's primary use case. I am a cyclist with an Edge 520, 820 or 1000 and I want to download routes more easily from Strava and Ride with GPS. This is routeCourse's primary use case. I am an athlete with a Fenix 5 or Forerunner 935/645 and I want to download routes more easily from Strava and Ride with GPS to use with the built-in Run/Bike app. This is another routeCourse primary use case. I am cyclist with an Edge, or a runner with a Fenix 5 or Forerunner 935/645, and want to view a small map as a data field: this is mapField's purpose. I am an athlete with a Fenix 5 or Forerunner 935/645 and want to see detailed maps on my watch: dwMap with our Premium "background maps" features offers this.